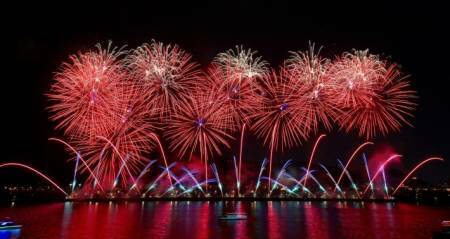 For the first time ever, the Cascades of Fire International Fireworks Competition is coming to Niagara Falls. Cascades of Fire will feature 18-minute pyrotechnic shows synchronized to music. This year’s competition will feature presentations from China, Finland, and Vietnam. Best viewed from Parking Lot 3 on Goat Island, Niagara Falls State Park. This viewing location is outdoors, so be sure to dress appropriately for the weather. Feel free to bring chairs, blankets, etc. There will be hot and cold refreshments available for purchase. Various speakers will be projecting the synchronized music. Free shuttles will be transporting event go-ers to and from Parking Lot #2, also located on Goat Island as Parking Lot #3 will closed off to vehicle traffic.